75 y.o. 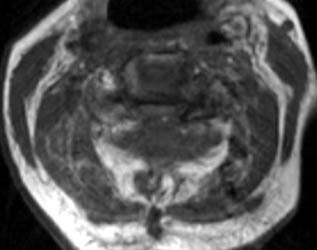 female with about a two-year history of continued gait abnormalities and decreased dexterity. On examination her strength was normal, however, she had bilateral Hoffmann signs as well as bilateral Babinski signs. Her strength was 5/5 but her gait was ataxic. Magnetic resonance imaging showed severe stenosis at C3, C5 and C6 levels. She underwent C3-C6 laminectomies. Immediately post-operatively she did well, however, within 36 hours of the operation, she slipped and fell due to spilled milk on the floor . After that injury, the patient was neurologically intact. However, on postoperative day #2 for morning rounds, the patient was noted to be confused and weakened on the left side, both arm and leg, leg more than the arm. 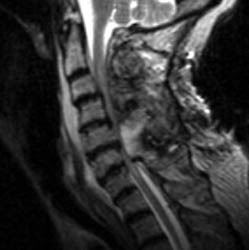 An immediate CAT scan of the brain and cervical spine was obtained. Immediate MRI was also obtained. Non-enhanced sagittal T1 (A), sagittal T2 (B) and axial T1 images demonstrate a large fluid collection, predominantly low signal on T1, bright on T2 with a few areas of T1 hyperintesity mixed within. These constellation of findings are consistent with a post-operative epidural hematoma with blood products of various ages. 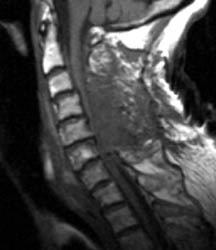 There is severe severe spinal canal stenosis at C3-4, and very severe spinal canal stenosis at C4-5 and C5-6. The cord is markedly flattened in the anterior-posterior dimension, to approximately 2-3 mm secondary to mass effect from this fluid collection. There is abnormal T2 weighted hyperintensity within the substance of the cord at the C5-6 and C6-7 levels, consistent with some edema.